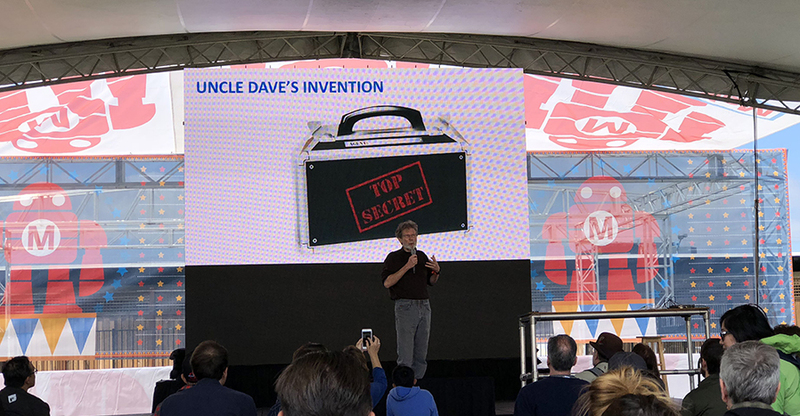 The 13th Annual Maker Faire Bay Area, which took place May 18th-20th, once again did not disappoint. The weather was beautiful and there was an estimated attendance of 90,000! Packed with hands-on and how-to sessions, makers young and old were inspired and excited. New programming was added this year: Thursday After Dark at the Exploratorium; Industry, Career, & College Day on Friday (See: The World Needs more Makers article on PCMag.com); and there was the addition of the Learning Lab in Fiesta Hall. 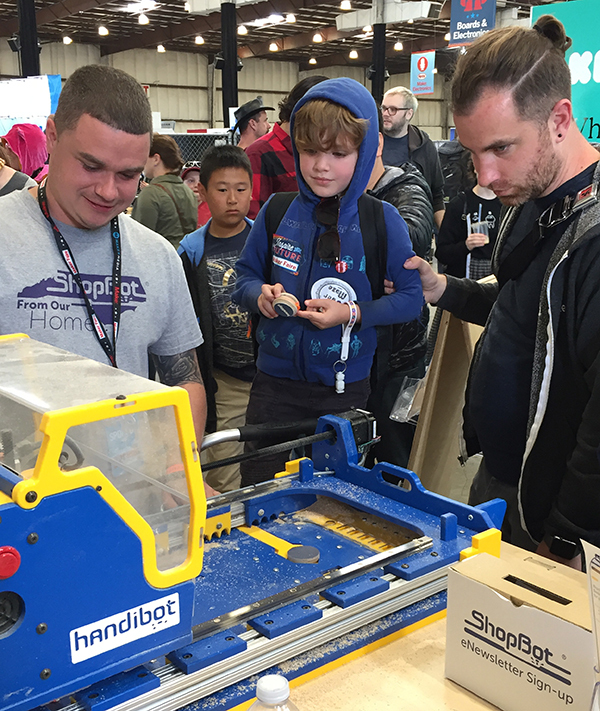 The ShopBot booth was converted into a pop-up factory; creating a start-to-finish production line using the ShopBot Desktop MAX, Handibot® Large Sheet Tool and Handibot Smart Power Tool – Adventure Edition tools to make yo-yos. Yes, yo-yos!! We painted and pre-cut baltic birch 1/2” plywood into sheets to fit on the Desktop MAX. Then, we handled the cutting, drilling, and carving as a batch process for the insides of the yo-yo pieces. Engraving and edge round overs on the painted side of the yo-yo pieces (the fronts) were then processed on one of the two Handibots. After the machining operations were complete, we lightly sanded the pieces, then completed assembly using a dowel pin and string to then pop the sides together and…voila! Using our booth as a live production and assembly shop was a demonstration of how many products can be designed, then manufactured, using CNC (digital fabrication) in a systematic, consistent, and highly efficient manner. 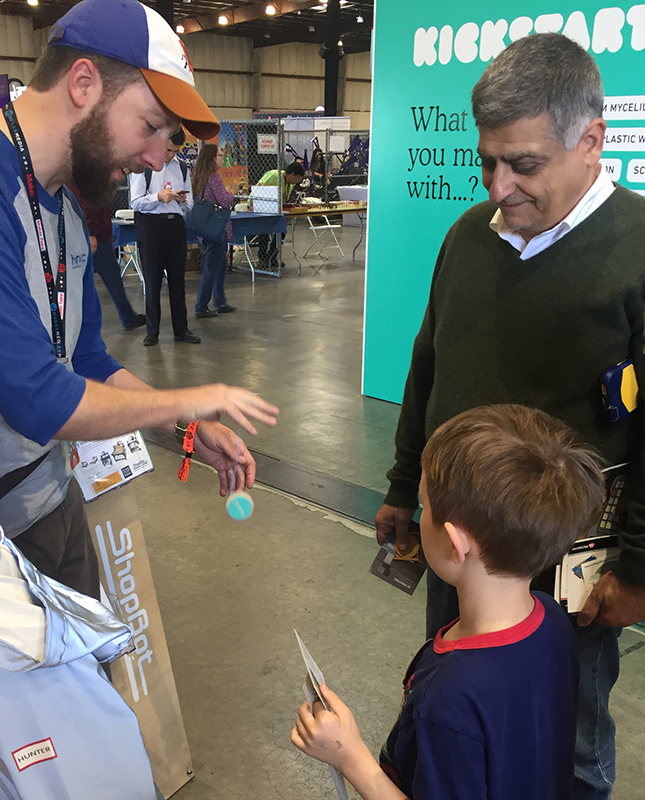 Close to 1,000 yo-yo’s were distributed to attendees at Maker Faire over the 3 day event! We were thrilled with the abundance of social media posts generated at Maker Faire. 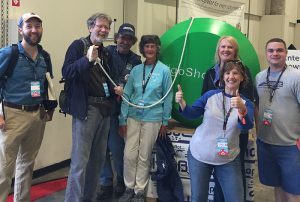 Posts were shared by makers with the yo-yos created at the show and pics of themselves with our giant 44” foam yo-yo (cut on a 4×8 PRSalpha tool and assembled pre-show) with the hopes of being selected as the drawing winner for the Handibot Smart Power Tool giveaway. We selected at random from all the social media posts shared publicly and tagged with #goShopBot, #goHandibot, @ShopBotTools, and @HandibotTool. And the winner is… Heather Taylor Price! 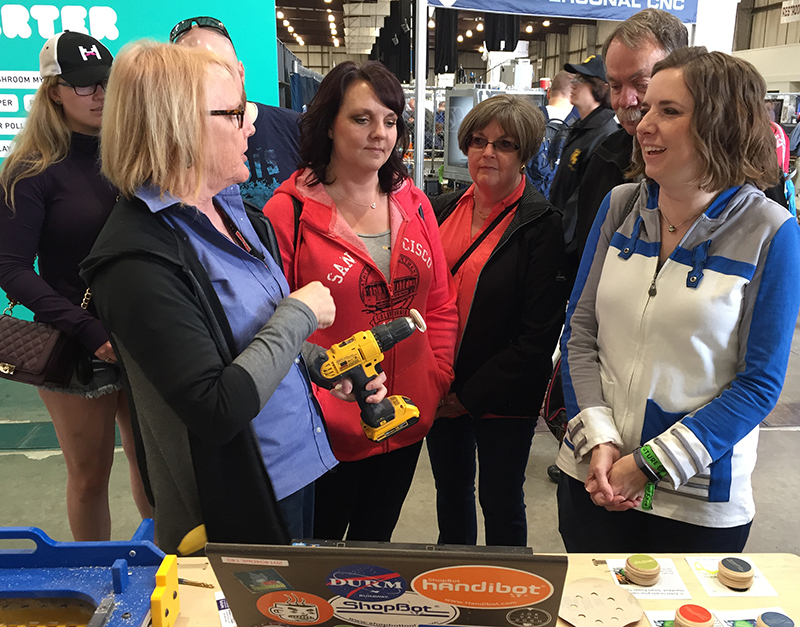 Heather is a maker and works at a library makerspace at a high school in Utah – she has been considering adding CNC to the makerspace for quite some time and now has the opportunity to do so. We can’t wait to see what she comes up with for the students to tackle! You can follow Heather on Twitter: @skyridgelibrary and @heathertaylorprice. 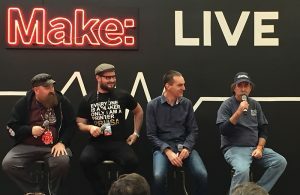 Midday Saturday, our very own Bill Young participated in a panel discussion at the MAKE: LIVE stage. Experts in digital fabrication including Josef Prusa (Prusa Research s.r.o. ), Dan Shapiro (Glowforge), and Bill Young (ShopBot), moderated by Matt Stultz, discussed the current state of digital fabrication and where they see it moving forward. One of our big highlights was Saturday afternoon, at the MAKE Center Stage. Ted Hall presented: “How Digital Fabrication Promises to Make Small, Fulfilling, Local Manufacturing Competitive Again.” Ted talked about an invention his uncle had designed 30+ years ago and how, until very recently, there wasn’t an affordable way to produce this or many other inventions without excessive upfront costs and huge production numbers. Today, however, with the availability of enabling tools in the digital fabrication realm (CNC, 3D printers, laser cutters, etc. ), Ted’s uncle and makers all over the world can be competitive. Ted’s presentation was based on a series of Medium articles that he’s been writing. Learn more about these themes: leapfroging current mass-production and replacing it with methods that can make the small producer competitive again, Digital Fab Renews Small Mfg, Complexity Comes Free, Leveraging Agility & Entrepreneurial Energy. The next opportunity to hear Ted Hall, ShopBot’s Founder & CEO, speak will be at the CNC Symposium at IWF, August 21st. Maker Faires are popping up all over the world. 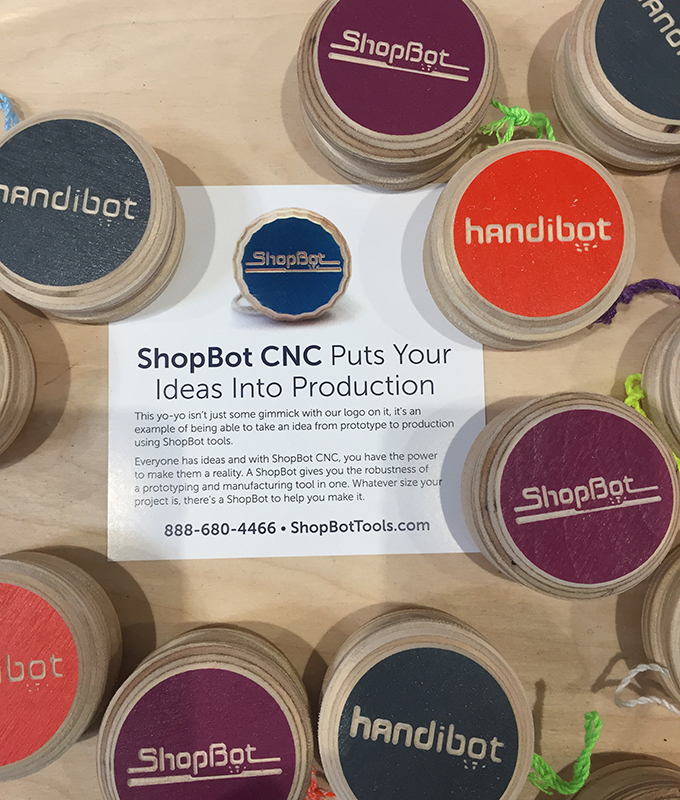 While we can’t be at all of them, we encourage ShopBotters to take their Handibot, Desktop, or Desktop MAX to a Maker Faire nearby so you can show off what you design and make. You get to watch kids of all ages light up, they learn about how to make a classic toy (like what we did) or another object, and it provides an opportunity to get to know other makers in your area. Find a Maker Faire near you.